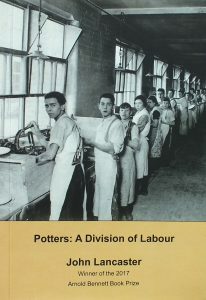 John Lancaster’s brilliant collection of poems about his early work experience in the potteries is the first winner of the Arnold Bennett Prize. The book is £8, with £2 p&p. There aren’t many left! John Lancaster’s brilliant collection of poems about his early work experience in the potteries is the first winner of the Arnold Bennett Prize. The book is £8, with £2 p&p. There aren’t many left! An award-winning poet in the National Poetry Competition, now living in Totnes, Devon, John Lancaster’s fifth collection is rooted in his home territory of Stoke-on-Trent, North Staffordshire. In a sequence of eighteen poems, he depicts work and life at the Alfred Meakin Pottery, Tunstall in 1964. Moving and funny yet honest in dealing with issues of politics and status, from Cup Handlers to Clay Carriers, we see the skills and hard life it needed to make, as Beryl, The Decorator says, ‘pots which meant so much.’ This is a tribute to the warmth of the people of an area and to an industry whose craftsmanship and creativity have much to celebrate.